When word came that Jerry Grant was dead, the first thing I thought about was a moment in downtown Detroit during one of the Grand Prix weekends of the ’80s. Grant, driving a very visible gold and black Jeep, found himself caught in a huge throng of Detroit Pistons fans moment after the team had won an NBA championship. The celebration was wild, with gunshots, fires and looting going on all around. Grant feared for his life, but this was a guy who had dealt with tough decisions in the heat of the moment many times on the racetrack. He quickly rolled down the windows, stuck his head out and began screaming “Yay Pistons!’’ at the top of his voice. Driving slowly but steadily through the crowd, he was high-fiving hundreds of hands and yelling so loud he began to lose his voice. But he made it back to his hotel without incident. Jerry Grant, who was 77 when he died on Sunday, was one of them. Life’s adversities never kept him down long. He was best known for losing the 1972 Indianapolis 500 when he was penalized for stopping in teammate Bobby Unser’s pit for a tire change late in the race. The fuel tank in his own pit was empty and Unser’s hose was momentarily attached to Grant’s car, although it was never proven that he took on any fuel. In the end, he finished second to Mark Donohue but was penalized back to 12th for stopping in Unser’s pit. Lost in the debate over that gaffe was the fact that Jerry Grant was one heckuva race driver. He could drive anything with two – he loved motorcycles – or four wheels, and he did. Among his other accomplishments was being the first driver to officially complete a lap over 200 mph in an Indy car, hitting 201.414 in 1972 at Ontario Motor Speedway. The great Dan Gurney, a fellow Californian, had Grant as his co-driver for numerous sports car races and, in 1966, the two came close to winning both the 12 Hours of Sebring and the 24 Hours of Le Mans before mechanical problems stopped them in each race. 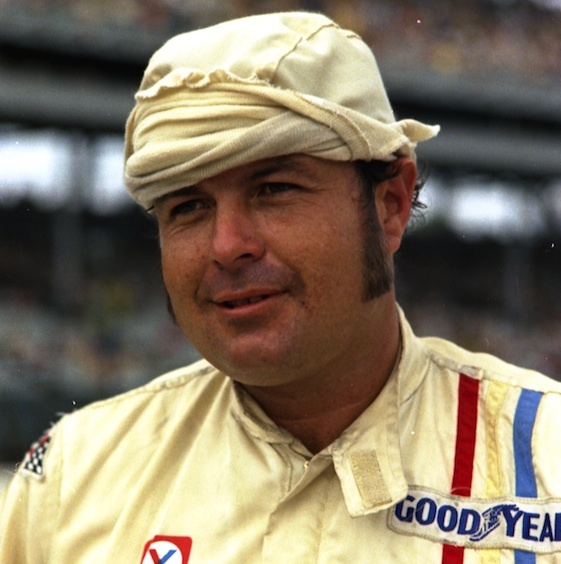 Among his best drives, Grant finished fifth in the 1967 Daytona 500, after starting 43rd, and had three top-10 finishes at Indy, including a seventh-place in 1970. Grant loved to tell stories and just about everybody he met instantly was his friend. Once his career ended, he turned that talent into a job, joining the Champion Spark Plug Company’s Highway Safety Program, speaking to school kids, military personnel and civic groups. And he loved practical jokes. One of his favorite – an oft occurring prank – was to sit on the passenger side of a friend’s car and suddenly reach over, grab the shifter and slam the car into park. As the car would skid to a stop, with the driver hyperventilating, Grant would roar with laughter. Eventually, the driver would have to laugh, too. Of course, Grant was hated by rental car companies and, after a while, had trouble even getting a rental under his own name. But that was part of the game for the big guy. Neither one of us was going to the racetrack much in the last couple of years, so we haven’t seen each other in some time. But the memories of great times together and of his humor and friendship will not fade with his passing. Rest in peace Jerry. You were one of a kind. He was Scott Goodyear before Scott Goodyear and he was quite the class act.